Blast from the past: originally published March 9th 2001. 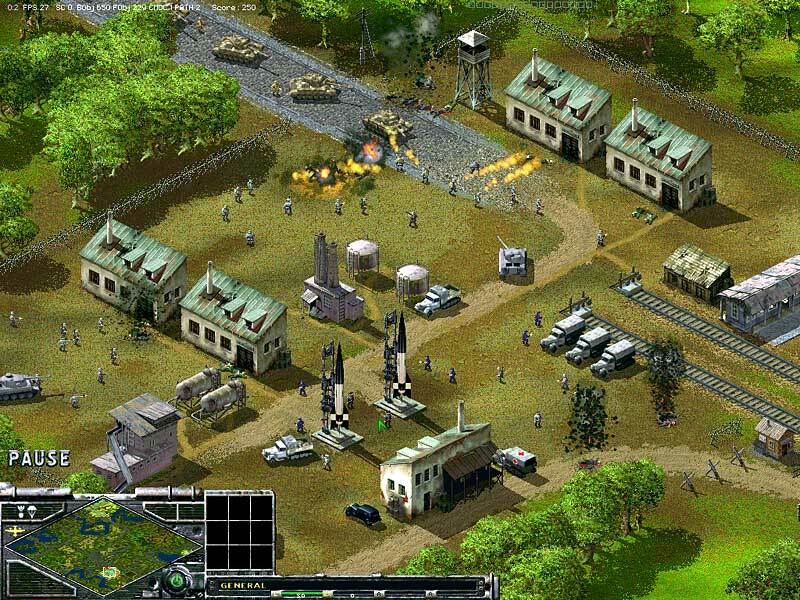 Quite a few games from Europe have caused a stir in North America, but none as much as Sudden Strike. This real time strategy cleaned up the awards from the European gaming community last year and has finally hit our shores. 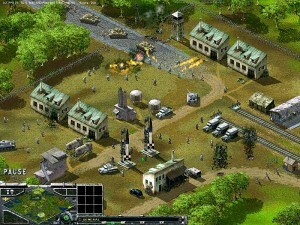 Sudden Strike wowed me from the get go for it’s straight forward gameplay and excellent graphics. I say this in the face of quite a few negative reviews I’ve read, all of which seem to miss the point of this title. 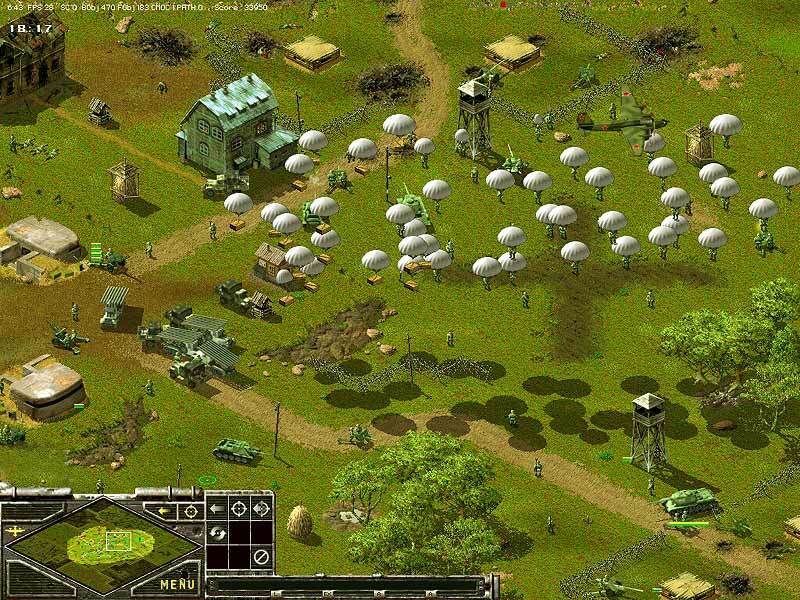 This is a real time strategy game set in World War II. Playing allies, Germans or Russians ( should be Soviets ) you start each mission with an excellent briefing outlining objectives and opportunities. You’re assigned a set number of troops and must complete the mission with what you’ve got. If you’re lucky reinforcements, supplies or air support are provided to assist in meetings your goals. There’s no building, harvesting resources or training involved: you’ve got what your given and that’s it. A variety of units are at your disposal, but fall into four categories; troops, armour, artillery and support. Each category has a variety of units available, and all four categories must be used together to finish the missions. Officers have the best sighting, and should be used with artillery that have the best range but poor sighting. Infantry and tanks must advance together or you’ll loose. While the variety is plentiful it gets hard to distinguish units at the highest resolution of 1024×768; I separate my units into groups and use them like that to keep things organized. The key to the game is managing what you have effectively, repairing your units, retreating if necessary. We’ve become so used to just building a fleet of whatever the best unit is and swarming the enemy. Rushing the enemy just doesn’t work, because you’ll be crushed by artillery before you know what happened. Gameplay is smooth but slow. Since you’ve got to really plan each advance and attack a mission might take 3 or 4 hours. To ease this a bit you can pause the game, issue orders and then resume. The graphics are simply gorgeous, with rich details and smooth operation. Sound is a so-so affair, with some language problems and muddled dialogue. The entire map can be destroyed, from houses and bridges to trees and shrubs. By the end of a mission black craters cover the landscape from your artillery and tank shells. Controlling units is straight forward: click on a unit and a square with 9 boxes appears at the bottom. Depending on the unit some or all of the boxes will be used providing options like assault, cover, stop, attack, repair. Dragging a box around a group selects them all, and double clicking a unit selects all of that type currently on the screen. Assign groups to hotkeys, same as all the other real time strategy titles. Multiplayer is handle much differently than others. You pick a map, team and nationality and the game launches. 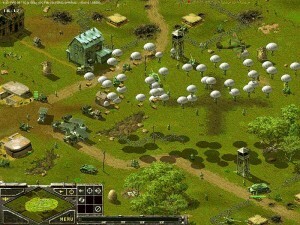 Scattered around the map are zeppelins; capture them all and eliminate the opponents to win. If you don’t have a zeppelin you loose in 5 minutes. Capture enemy zeppelins to receive precious reinforcements. At first I didn’t like this at all, but it seems to be the only fair way to do it. If one side had to capture and one defend, then the defenders would have an undue advantage. How else could you fairly give reinforcements, but by taking ground from the enemy? The game’s not perfect, but the faults are few. I keep having trouble with trucks getting stuck in the woods and not being able to get out. As well the sound is buggy, and the infantry units are quite small. In the grand scheme small problems indeed for such and excellent game. Don’t take my word for it: grab a copy of the demo and see for yourself. Sudden Strike provided courtesy of Strategy First.